Real Madrid vs. Barcelona is about to begin on 24 April 2017 [IST]- The most awaited match of the season. The second league of El Clasico 2016-17 will be held at the Santiago Bernabeu. Barcelona hosted the first leg that was one of the best El Clasicos. Although Real Madrid is in excellent form as they are leading the points table right now, can they stop unstoppable Barca? In the league, Lionel Messi, Luis Suarez, and Neymar are the dominating stars. While the Trio is expected to start against Real Madrid. The live screening of sports events on a large screen is accessible in Europe and La Liga. It has recently launched its India office, will be organizing the event with the aim of popularizing the league in the India. Jawaharlal Nehru Stadium and Khar Gymkhana in Mumbai are all set for the evening. It will include giant screens, food, and beverage stalls as well as fan engagement activities. 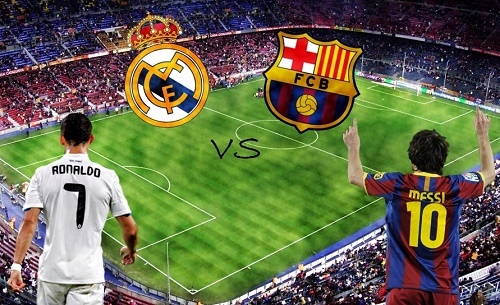 Real Madrid vs. Barcelona match of the 2nd league in La Liga will be played on 23rd April. La Liga is known by El Clasico name in Spain or Spanish speakers. Last El-Clasico match Real Madrid vs. Barcelona has been tied by 1-1 which was played on 3 Dec. It is the first El-Clasico of 2017 played on 24th April in India at 12:15 AM IST. You can watch Live Telecast of El Clasico 2017 Match in India on Sony Six and Sony Pix tv channels. For La Liga in India, Sony tv network is the official broadcaster. Former La Liga star Luis Garcia will be present in New Delhi while Frederic Kanoute will attend the Mumbai screening. It’s a super Sunday night clash. But for Indians, it will be late Sunday night. You have to watch it on late night. Traditional rivals Real Madrid and FC Barcelona will face each other in a viral clash to win the La Liga 2016-17 trophy. Last time, Barcelona has won the award of La Liga. Live Match telecast can also be watch from the internet on SonyLIV.com. Real Madrid will be looking for the no. 1 spot till the end of this season. They would like to gain no. 1 spot by beating Barcelona at their home ground. Madrid is currently at NO. 1 with 72 points in 30 matches. They have also played one game less than Barcelona who has 69 points. If Madrid won 24th April El Clasico game then they 6 points lead against Barcelona. Real Madrid has won 22 games out of 30 games. While Barcelona has won 21 of 31 games, they played. Atl Madrid and Sevilla are much near from both top 2 teams. Barcelona lost their last game. While Madrid added one point on their score by playing draw with their city rivals Atletico.